We really lucked out and happened to catch The Brindle Room on a night where the cheeseburger was on special/on the menu board. It was not normally on the evening menu. 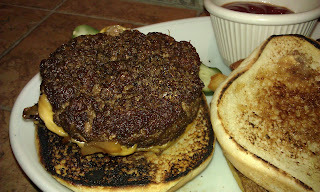 The burger was generally available only for Sunday Brunch and Monday evenings in the event that any beef was left over. Ladies and Gentlemen, the BurgerBusters have discovered our new favorite cheeseburger in NYC--Tess of the B'Urgervilles, Fat Bruce Lee, Pepsi Max, and I were all in agreement that this was the best cheeseburger that we have had in New York. The Beef : The Brindle Room's burger was all dry-aged steak trimmings from Sebastian's in Morristown, NJ. This tasted of nothing but prime cuts of high-quality beef. The beef was coarsely ground and left alone until it was time to gently formed it into thick, loose patties. The fat content was high, 30%, but much of this rendered off as the burger cooked. The chef incorporated deckle, the fatty cut from the Ribeye into the blend, so this was delightfully rich and nearly creamy. Preparation: The best way to describe the cheeseburger at The Brindle Room: Meat candy! 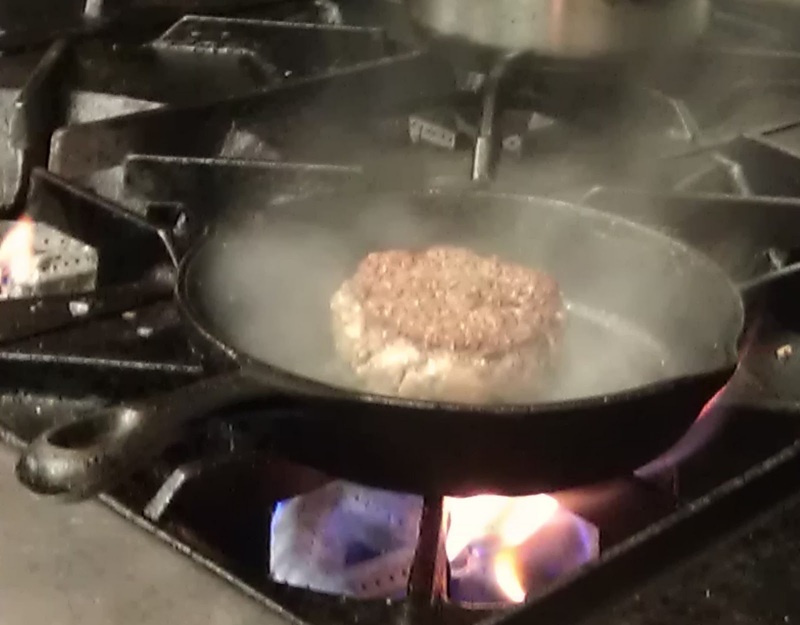 The burger was layered with a twice-seasoned sear from an excruciatingly hot, unoiled, cast iron skillet that must have been heated with a plasma torch. This resulted in an even, thin layer of Well-Done beef followed by a ridiculously juicy and lush layer of warm, rare nearly pornographically red beef in the center. The resulting bite was juicy, complex, and wonderfully meaty. It was a perfect and refreshingly hot Med-Rare. 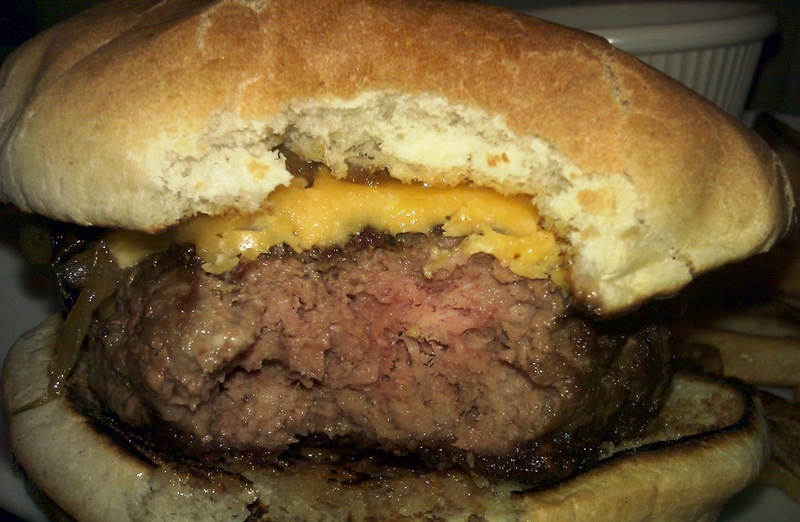 The burger steamed when cut in half yet retained a nearly raw center. There was no doneness gradient--it went from Well-Done to Med-Rare. Seasoning: A goodly amount salt and pepper were applied to the uncooked nearly white patty, patty. The seasoning was forced beneath the thin but complete sear, and it was apparent on the surface. The seasoning complemented the burger perfectly. 5. Aged beef funk, which lingered for a moment on the tongue. The Cheese: Was there cheese? The cheese was a capable, competent, and flavorful American. Two slices, so double the fun. The gooey American cheese completed the bite in terms of texture and umami flavor. The Bun: Was there a bun? It was a double toasted, seeded, hamburger bun. The hamburger bun at The Brindle Room was not sweet enough to interfere with the complex and savory flavors of the burger. This bun was tender and not even remotely chewy. It was a perfect delivery device for a nearly perfect burger--the sole qualm was that the burger was a little oilier than I would have preferred. Meat to Bun Ratio: The burger was the clear winner--the juices of the burger overwhelmed and saturated the bun. This was not entirely unwelcome, because the burger was so refreshingly juicy. The Fries: They were dark crispy, and hearty--they were heavy on the potato flavor and cooked in peanut oil. The hand0cut fries were perfectly seasoned. They were crisp enough that they made a ringing sound in the metal bowl in which they were tossed to distribute the seasoning. The Value: At $10, the cheeseburger at The Brindle Room was a lot less expensive ($16 less expensive) than the griddled with grape seed oil, Pat La Frieda, Black Label Burger masterpiece at the Minetta Tavern and just a little bit better. 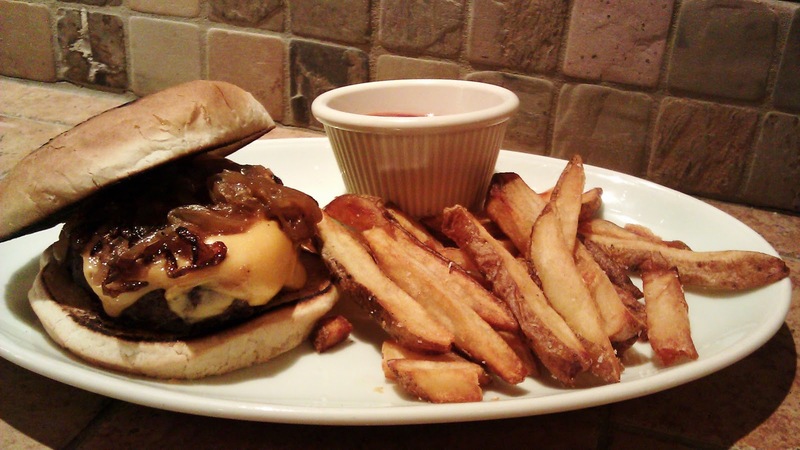 The value of this remarkable cheeseburger was unsurpassed in terms of quality of ingredients, preparation, and taste. The amazingly seared and seasoned burger at The Brindle Room boasted more complexity than the remarkable Black Label Burger due to the precision of the cooking process and the variety of the cuts of beef. Further it was less tricky than the aged steak fat infused delight at the now closed The West Branch. Burger Review : Fat Bruce Lee and I ordered a second burger to split for dessert. We could not get enough of it. The best cheeseburger that we have had in New York. Tess was quoted as saying, "I wish I hadn't brushed my teeth after that burger." It was that good.